Lets begin dissecting this old game, now that all patches, updates and expansions have been released. 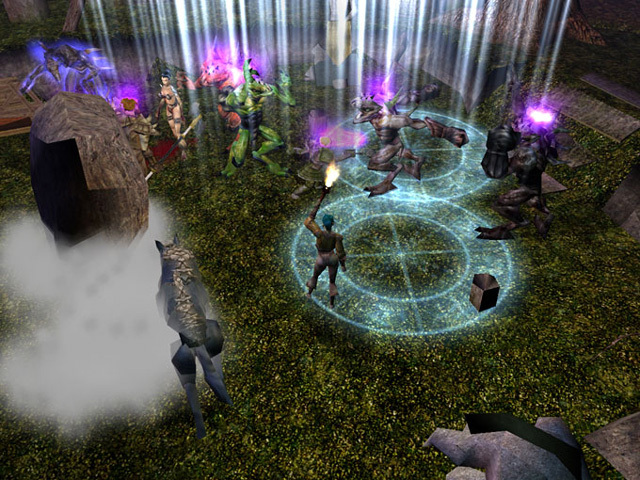 Neverwinter Nights is yet a role playing game in the Forgotten Realms world, and uses Dungeon and Dragons ruleset 3.0. What this means will be discussed later. And yet another thing to note: Though the expansion packs "The Shadows of Undrentide" and "The Hordes of Underdark" are not tight with the original game I will still mention their story. Neither the graphics nor sound went better, but the storry did. I will refer to Neverwinter Nights as "NWN" and to its expansions as "SoU" and "HoU" respectively. NWN "supposed to be" a Baldurs Gate 3. Yes it should have been a replacement for something not to come at all . Black Isle - the company who supposed to do BG3 and helped BioWare to do BG2 and BG1 - smashed up and BioWare did NWN instead. With a new engine, but without the master story tellers from Black Isle. This is the weakest side of NWN. Though it seems "well" plotted (you being on an academy trying to safe the city Neverwinter) you will soon find out that it does not really gets too deep. Something a real RPG fan (and someone who has seen better from BioWare - the creators) like me really missed in this game. The story appears to be broad. Broad in a sense that the goal is always ahead and able to master, though all those little side stories (quests as some might refer them to) are "in your way"; Or a waste of your time; or let's put it the way it really is: "Just" a training for you to be prepare for the "final task". Small glimpses of good story telling are there - but they are rare. Yes even sometimes, story itself fades into the background to be replace by plain "action" and "entertainment". This causes the entire game to drift towards an hack 'n' slay game. A pity. There are a lot of things to mention. First you are alone. If you have played action "RPGs" (hack and slay stuff - which can be barely associated with *any* role playing) this is might not be a surprise to you. There is just one "mercenary" you may hire for your services. But which is in fact totally worthless (just like the "mercenaries" on Diablo II). Though the loss of individual fellows was a loss for all RPG lovers: No romances between a party member and you. And no real roleplaying while acting with your fellow people. Though there are some minor things where you may act like your alignment says and even affect something with it. Not that just a few gold and some "your alignment has moved toward <alignment-of-your-action>" would really make you feel different though. Choosing to be evil and doing it straightly does not change the entire story. No single bit. It just lets you end the sub plots differently. Looting is senseless. 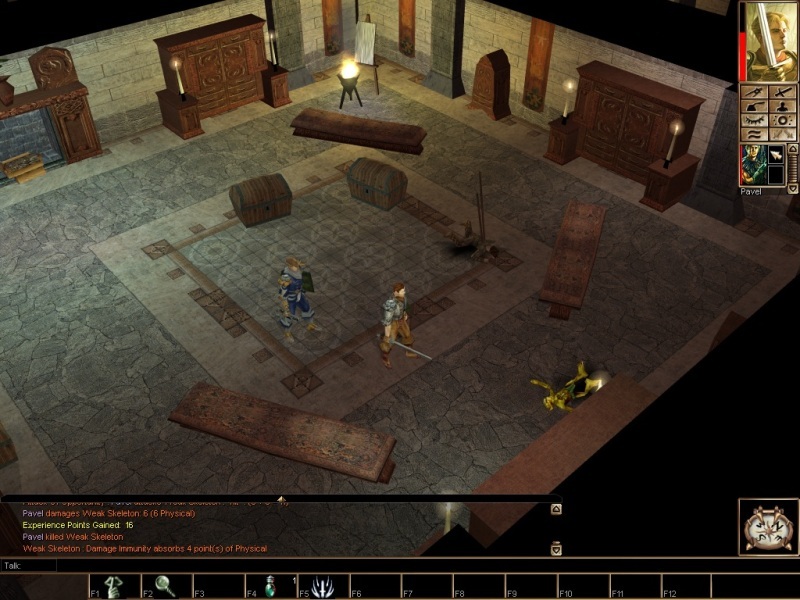 Just a tip asside: "Looting" or raiding houses in the original NWN campaign and/or chests which are locked is a waste of time. You stand there a minuite to break down a chest just to find twenty gold pieces. And now to the "action". Battling has vastly changed in the 3.0 rulesets. Really, believe me. First of all, the battling system has become "easier". Easier to understand, and even a lot easier for a single killing machine to master several enemies at once. 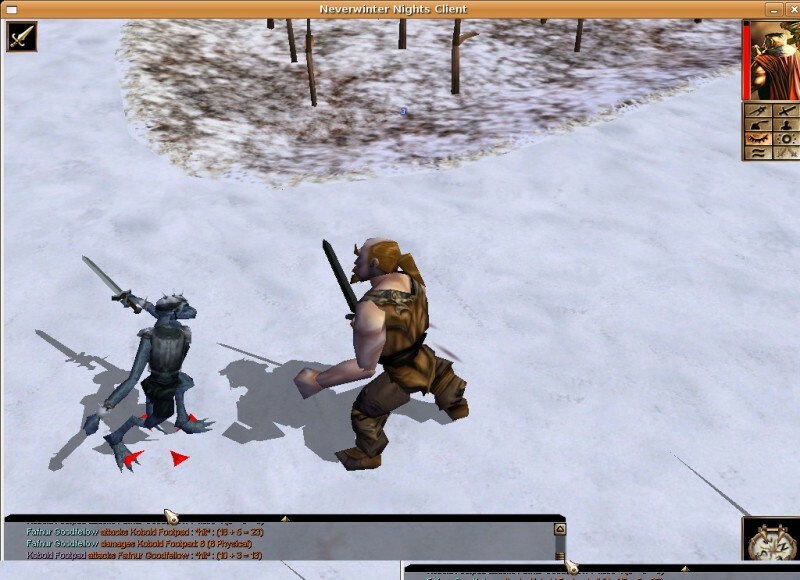 Where at the 2.0 system, strategy and the clever use of all your party members and their benefits and drawbacks lead to victory; a single skilled 3.0 warrior could do the same in less time; leaving the game in a surreal, action-lasting state. You cannot die anymore too. A pity. Where an older D&D RPG game like Icewind Dale or Baldurs Gate would prompt you to reload and start again, you are simply "transited back safely" in NWN. I really hated this. 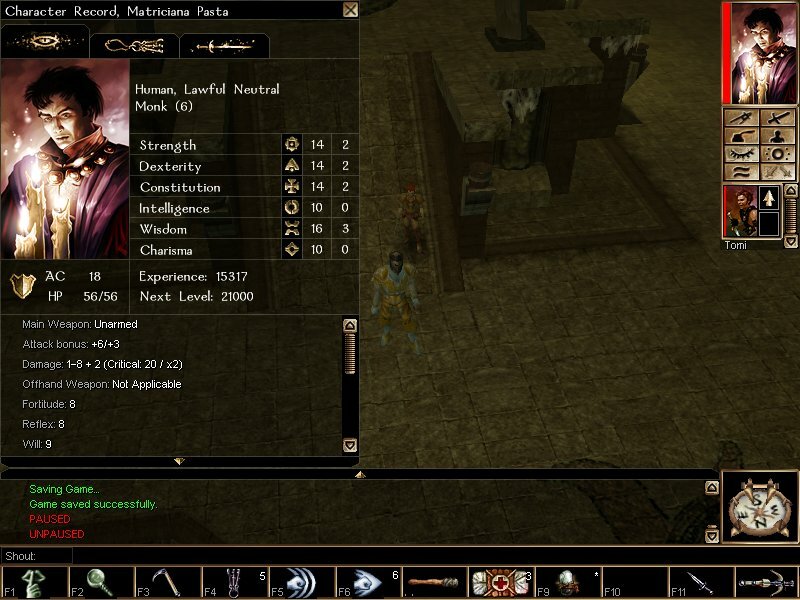 You might now counter that a skilled priest or druid in BG2 could also revive a party member; a dead party member during a battle is most of the time a sign for losing the battle. Though this "benefit" or reviving would vanish if you have no party - you cannot revive yourself obviously, I would still have appreciated this kind of reality in game. Notice: This is not a feature of the ruleset. It is a "feature" of the game, thus compromising D&D suggestions. It is just to there to make the game easier. You can rest easily within no time. Resting is now just a moving progress bar, and is considered to be safe if no enemies are at your sight. While not being possible in the older games, where you might be attacked during your sleep it makes the entire game easier. This is also a "feature" of the game. One center. For exists. This is something you will encounter when playing almost all BioWare game: Freedom to choose when and where to leave for quests. It has its benefits, since you can prepare yourself what may come. But it takes horrifying forms in NWN. You will usually encounter one center city or village with four exists. All of those must be mastered to get to the next "center". Yet another fact that reminds me of hack and slays. This really makes the game boring after a while. 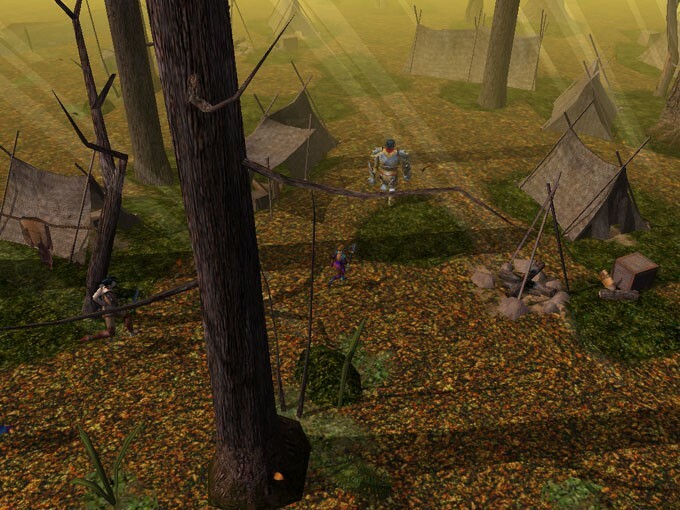 SoU is a replacement for the original NWN campaign. Though you can still use your character from NWN and hit directly into HoU , since the development of your character will be equal at the end of SoU and NWN. HoU is should only being played with a well leveled character. It seemed that the creators of NWN learned something from their old mistakes. SoU and HoU (in the order they should be played) introduce a more linear story. You easily walk (or fall) from one plot to the another, without or with fewer times to have "timeless freedom to do everything". This is more the way I like it to be, since you are not getting bored and always are curious on what will happen next. The creators also showed some creativity when designing the plots. They have introduced a new load of events, riddles, places, sub "quests" with varying stories and new monsters. You even come to play commander by placing soldiers on strategic places to defend a settlement - or place none at all if you are evil alignend. You also have the freedom to align with the "enemy". Or you may use catapults to attack your enemies, or even transform you into several other creatures (small, and big) to help you solve riddles. Though HoU lets your character develop even further ("epic" levels) the barrier of level 21, this is also its greatest "weakness". We talked about the "furious single killing machine" earlier, remember? Well the machine is getting more efficient in HoU than you could ever imagine. Striking down one of the most powerful creatures including Lich-Dragons and Higher Devils? Oh my no problem for an "epic" ascender from a human world. But so far this is the only drawback HoU has. I still think the extension back is much better than the original HWN campaign. So I tell you: When buying NWN, buy the combo back with the extension and play them instead the original campaign. You wont regret it. Though graphics are a little bit "outdated" and don't come with notorious stuff like the bloom effect, they can look nice. Especially when being in a forrest when the sun light shines through the roof top. Beautiful graphics indeed. Though inner rooms (like towers or castles) will tend to get boring after a while. Animations are well done though, and they are truly something for the eye: You can see your character and the enemy blocking and attacking. The animations are almost as good to overlay the fact that the game is turn based. Attack sounds are there, such as music is. Crucual background sounds (like childrens screaming for help, or the screams of a victim in his agony) are there, but tend to get boring or even annoying after some time. Voice actors for the most important NSC's are there too. The sound is not overwhelming, but it does its part. There are additional things to notice. First of all, this games comes with a GNU/Linux version. Something which is quite rare in the game scene. And it comes with modding and creation tools to create your own stories and modifications. The tool is yet easy to use, and does not require 3D modelling skills or high programming skills to be used efficiently. > NWVault. The source for custom mods.